Girlz Gone Riding July News! San Gabriel Mountain NM – Public Meetings June 22-27. On a beautiful warm day for riding in Malibu Creek State Park , there was a surprisingly small group of only 10 at the free Basic Skills Clinic , which is always held the first Saturday of the month. You can see the photos in our May photo gallery. It's complicated There’s always a lot going on here in Southern California. We have recently submitted comments on the Rim of the Valley study. We’re expecting the Santa Monica Mountains NRA Interagency Trail Management Plan early next year. A new National Monument management plan development process just began, though CORBA has been involved in the Community Collaborative Group since last November. We’ve successfully alerted L.A. County of the need for another trail master plan, to be announced soon. We have pending Bike Park proposals, and a recently-opened Bike Park in Fillmore. We have a growing high school and middle school racing contingent. We have a new Forest Supervisor. There are wilderness proposals, missing links in trails, fire-damaged trails still in need of restoration, access issues on Etz Meloy (Backbone Trail). There’s no shortage of issues, threats to our public lands, our trails and access to them. And it takes time to figure things out and try to get things right. These studies and plans seem to disappear from the radar, only to re-emerge six months to a decade later. Advocacy is a marathon, not a sprint, and CORBA is still at it after 28 years. Government is slow to move but no matter how frustratingly slow it sometimes seems, there is progress being made. CORBA is busily engaged in all of these processes on your behalf, in partnership with IMBA, to help make sure there is progress. We continue to work to make sure the landscapes we ride and the trails we love are protected, improved, and remain open to our community. We need each and every one of you to be engaged as well. After all, we’re all ambassadors of the sport when we’re on multi-use trails. This means ride an appropriate speed for your sightline (slow down!) and be courteous. Be safe. Follow trail etiquette best practices. Be an example for others. Leave no trace. Support CORBA. Sign a petition. There are lots of ways to have a positive impact. Riding trails to explore our public lands is a passion we all share, and want to continue to enjoy. Enjoy your summer and keep on riding! CORBA has been involved in the Rim of the Valley Corridor since our inception. In fact, we’re so ingrained in the process that the Rim of the Valley Corridor is mentioned in our mission statement as our primary territory of concern. We were excited to see the draft study released, and have submitted comments on the plan. The National Park Service presented four alternatives based on the study findings. The first “no action” alternative serves as a baseline against which we can compare the alternatives. 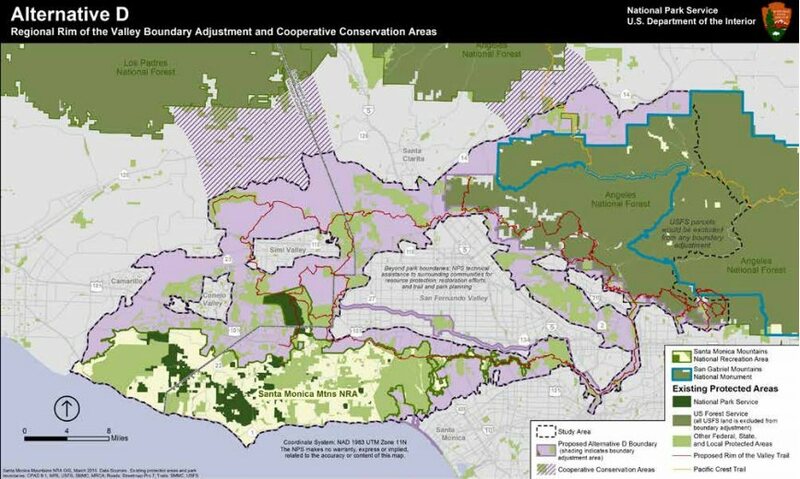 Alternatives C and D expand the boundary of the Santa Monica Mountains National Recreation Area. This would authorize the National Park Service to offer technical assistance to existing land managers for any project that enhances recreation, or restores habitat and connectivity, and to spend money on capitol projects within the expanded boundaries. We believe that the largest operational boundary proposed under Alternative D would have the greatest long-term benefit for recreation, bio-connectivity, wildlife and the communities adjacent to the study area. It also includes the wildlife corridors linking the two areas of the Angeles National Forest separated by Highway 14, as well as between the Santa Susana Mountains and Los Padres National Forests, that are missing from the other alternatives. CORBA will provide lunch for participants after the workday is finished. Please register in advance to help us prepare by knowing how many volunteers to expect. And... If you come out to two or more trailwork days in a year, we'll give you a cool long-sleeved CORBA trail crew shirt - be sure to ask for yours! 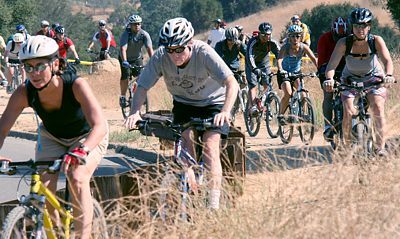 An evenhanded account of the issues surrounding conflict and etiquette on the trails was published on the front page of the July 25th issue of the Thousand Oaks Acorn. The article starts with an account by an equestrian in Ahmanson Ranch who felt threatened by mountain bikers who sped by and shouted expletives when asked to slow down. The equestrian also has been charged by unleashed dogs on other outings. Mark Langton, CORBA board member and past president, is quoted extensively on the need for mountain bikers to show speed restraint when passing other people on the trail. Another cyclists is critical of people who take poorly trained horses on trails where they can expect to encounter mountain bikers. 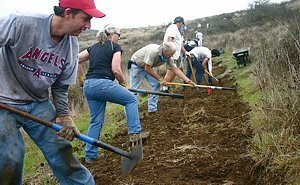 Finally, there are some quotes from representatives of the Santa Monica Mountains National Recreation Area, including Superintendent David Szymanski. Here are 10 simple tips and reminders you can do for riding in the heat. 1) Either plan your ride early in the am or late at night and keep it short if its going to be super hot. If possible, don’t go alone! 2) If the forecast is going to be hot, plan what day you will ride and start hydrating now! Water water water! 3) Wear a neck wrap cooler and keep an iced bottle of water in your cage to keep the neck wrap cold at all times. When your neck gets warm, just dump the cold water on the neck wrap and place around your neck again. It helps keep your body temperature down. 4) Make sure to have electrolytes mixed in with your water. 10) And lastly, pay really close attention to how your body is reacting to the heat at all times! Co-ed Night Rides Please keep an eye out on the GGR Google calendar & our FB page for our super fun, all level night rides. 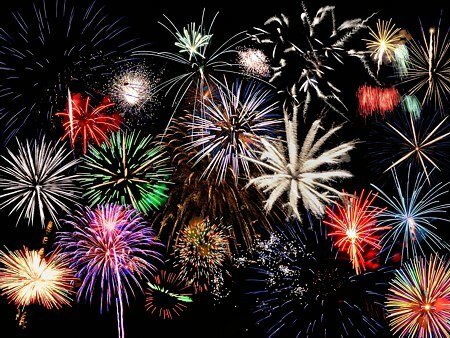 Saturday July 4th is the next skills clinic.